The arrival of summer is a fantastic time for viewing wildlife along the Emm. The skies are filled with birds many of them Swifts and Swallows which we only really get to see at the height of summer. Butterflies herald the start of warmer, longer days and, if you’re a butterfly enthusiast, it’s fun to see how many different species you can identify. Insects of all types will be more active and, if you’re lucky, you may even get to spot a few bats which will have a great interest in the increase in insects. The first of the summer migrants to depart are the Cuckoos. The adults leave in July to be followed by the offspring from this year later. Somehow they find their way to Africa independently. Woodlands are largely quiet by July as the main bird breeding period is drawing to a close and territories do not need to be advertised. The moths are now plentiful and can be attracted with lights at night. The large and magnificent Broad-bodied Chaser dragonflies can be easy spotted as they aggressively tussle with competitors over a patch of river, pond or wet ditch. They clash in mid air and with surprising loud impacts. Damselflies are common where there is any standing water. Hummingbird Hawkmoths look like tiny Hummingbirds - hovering in front of flowers and feeding on nectar with their long proboscis. Most years, between June and August these moths can be seen in Berkshire. They are day flying and often seen in gardens. They dart from one flower to the next and are expert at hovering, beating their wings so rapidly you can hear them hum. They are resident in the Mediterranean and migrate northwards through Europe in the spring. Hummingbird Hawkmoths breed in the UK but unless it's very mild are unlikely to survive our winters. Butterflies are one of our most enduring symbols of summer. The UK is home to over 50 species of butterfly. 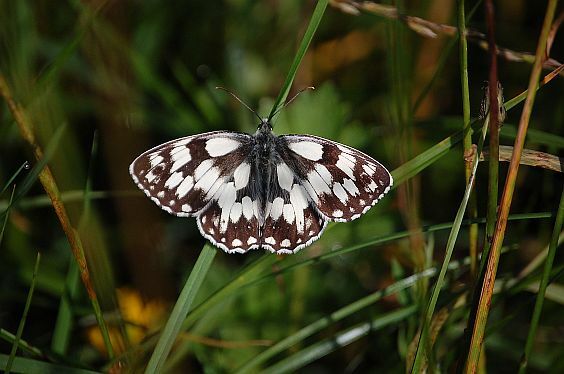 Marbled Whites,Common Blues are in flight alongside the Emm in July. In July many young mammals born earlier in the season are now out of the nest and visible You may spot baby Fox cubs. The evening is the best time to spot many species. This is peak bat-watching season. British bat species are garden friendly, eating midges and tiny insects that cause annoyance on summer evenings. The Pipistrelle bat is the smallest and most widespread, favouring buildings where they congregate in large colonies. They enjoy a modern house and will hide behind tile-hung walls or weather-boarding. Young are born in June and will fly in July. They feed on tiny Caddis Fly gnats and tiny moths and will continue the rest of the summer preparing for winter hibernation between November and March. A pond in the garden will ensure they have good food supplies available.There are 16 native British bat species, all are protected by law. Young litters of Hedgehogs are now learning their survival skills. You may see or hear them foraging for food at night. At this time of the year the showy rosebay willow herb can be found along the banks of the brook, Greater Bindweed can be seen climbing though the hedgerows. Its big white trumpet flowers open during the day then twist closed as night falls. Along the river banks the creamy white Meadowsweet flowers put out a heady summer scent and are accompanied by many other waterside species.